World War Z 2 is being put on hold for what may or may not be a very good reason. Last night, after months of swirling rumors, Brad Pitt was finally confirmed to reunite with his Inglourious Basterds director Quentin Tarantino for his newly-titled project Once Upon a Time in Hollywood for Sony Pictures. Shortly after that news broke, it was also revealed that Brad Pitt's involvement in this project lead to Paramount Pictures delaying principal photography on the already long-delayed World War Z 2, to accommodate their star. Here's what Variety reporter Justin Kroll had to say about the World War Z 2 delay on Twitter, while offering a casting update on Once Upon a Time in Hollywood as well. "On this one, don't know what this means for Cruise and this movie (likely means he passed) but had heard later this week that WWZ2 had pushed to the fall shoot leaving time for Brad Pitt to squeeze in this pic. My understanding is that Margot is still up for Tate and that Quentin Tarantino has met with a number of actors for other smaller parts and now that the main roles have been cast those smaller parts should come together shortly." World War Z 2 has essentially been in development since World War Z hit theaters in the summer of 2013, with this adaptation of Max Brooks' novel taking in $202.3 million domestically and $540 million worldwide, from a whopping $190 million budget. The movie originally had Juan Antonio Bayona set to direct before he backed away to helm A Monster Calls instead. Steven Knight (Eastern Promises) came aboard to write the script in May 2014, and almost exactly a year later in May 2015, Paramount set a June 9, 2017 release date. With little to no movement on the project, Paramount indefinitely delayed World War Z 2 last February, but in June 2017, it was finally confirmed that David Fincher will direct this sequel, his first feature film since 2014's Gone Girl. The last update we had on this sequel was in November 2017, when director David Fincher revealed in an interview that he is still working on the story, although it isn't known if he is doing so with writer Steven Knight, or if a different writer has been brought on to work with David Fincher. 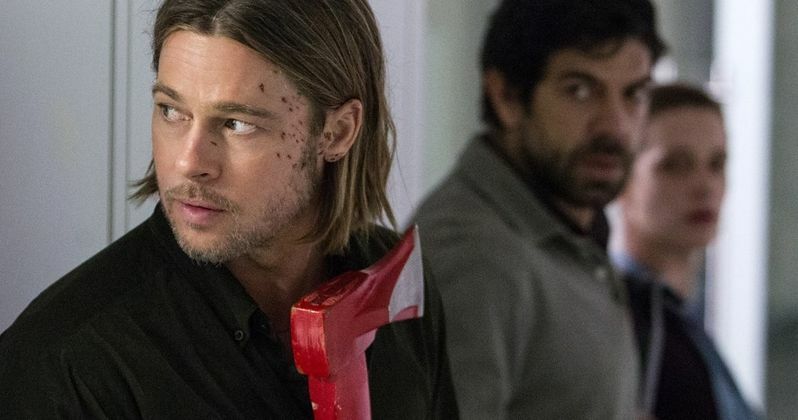 While Brad Pitt's Gerry Lane has long been confirmed to return for this sequel, it remains to be seen if other World War Z stars such as Mireille Enos (Karin Lane), Daniella Kertesz (Segen), Sterling Jerins (Constance Lane) or Abigail Hargrove (Rachel Lane) will be brought back for World War Z 2. Since there has been no release date announced for World War Z 2, this production date shift will give the production team more time to work on the script and put together a cast for this sequel, although no plot details have been revealed at this time. Since the first movie was based on the Max Brooks book, the sequel will be delving into completely new territory that will likely go beyond the book, but now with production being delayed, it may be quite some time before we have any concrete details on World War Z 2. Take a look at the tweets from Justin Kroll Twitter below, as we wait for more on World War Z 2.